With continuous search algorithm updates over the last few years, achieving first page rankings on Google has become a lot more difficult than what it used to be in the previous decade. You cannot just rely on content anymore for desired results. Factors such as site loading time, design and landing pages play a crucial role in day-to-day SEO campaigns. The best way to integrate all of them in your site is to opt for a perfect SEO WordPress theme. Doing this will not only give your site a unique look but also ensure that it performs well on different SEO parameters. 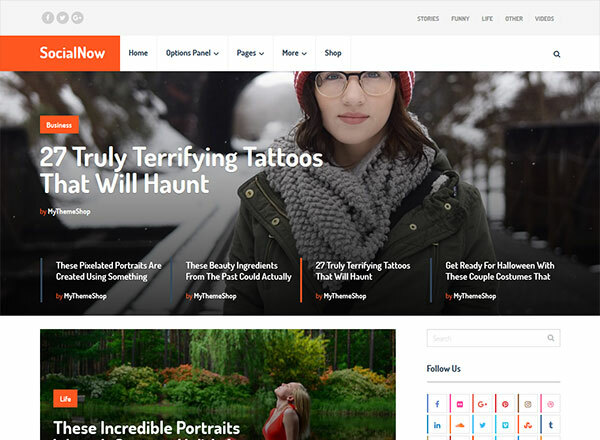 We have listed 35 most preferred WordPress themes for higher search engine rankings. All of them are SEO friendly and can help you achieve first page rankings. 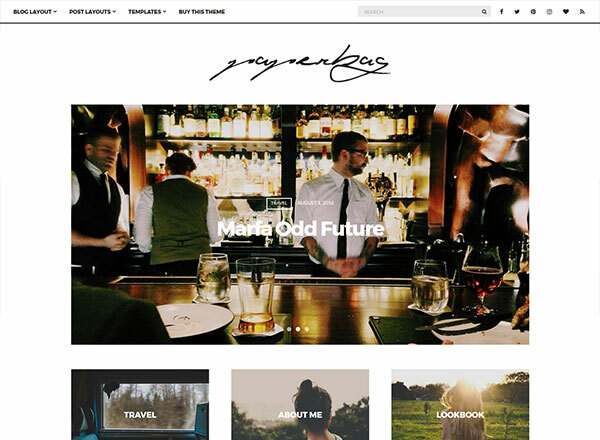 Take a look at these WordPress themes and choose the one that fits the bill. For all those site owners who wish to have a lightweight theme installed on their sites, Clean is an ideal option. It is a minimalistic theme designed by professionals for bloggers and webmasters who want clutter-free sites. There is no niche limitation imposed on this theme, which means you can use it on any site belonging to any niche as long as your goal is to have a fast-loading web portal. Use it once, and you’ll know why the WordPress community is crazy about the Clean theme. 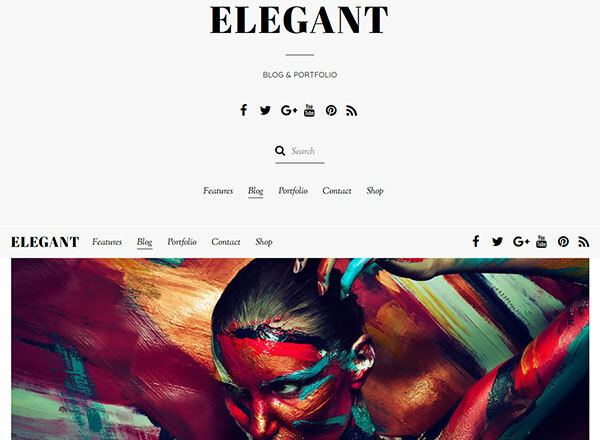 Elegant is a minimalistic and multipurpose theme which puts the entire focus back on the site content. Just in case you run a content rich site and tend to keep the attention of all the users intact on the site content by minimizing the graphics and animation impact, Elegant is a perfect option. The development team has put considerable attention to its typography, visuals and other features required to run a site successfully. 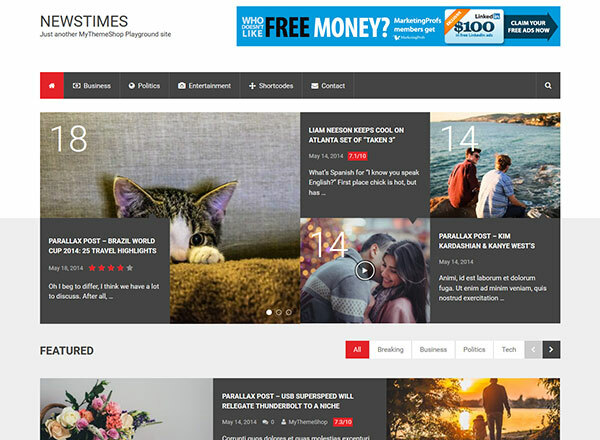 Some unique features of this theme include new image filter, grid and masonry layouts, multiple categories and large featured post design. Elegant is best suited for artists, writers, editorial sites, agencies and individual portfolios. 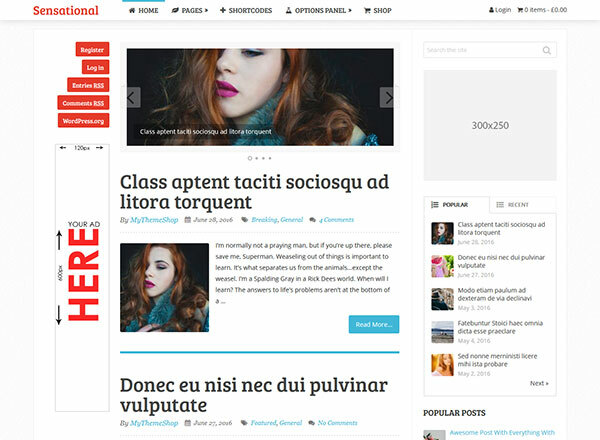 If you have a site driving enormous social media traffic and you want to multiply it, then go for SocialNow theme without any second thought. While the built-in social sharing and community tools can help you grow quicker than expected, its intuitive navigation makes it very easy for users to find content on your site promptly. Overall, world-class features and astonishing design of SocialNow ensure that you get the best possible ROI without wasting any time. 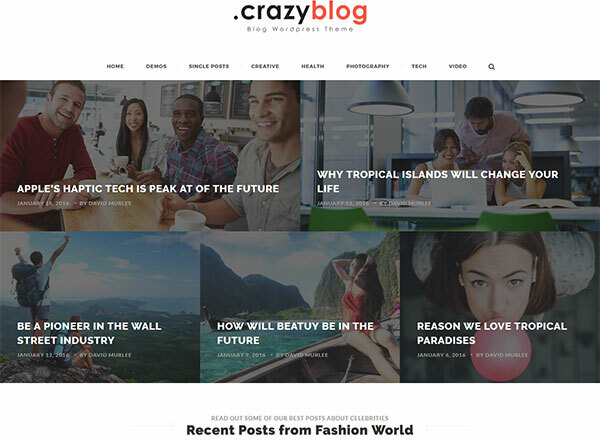 If you are a fashion designer, traveler, internet marketer, chef or any other professional wanting to start your first site on WordPress, CrazyBlog is the best theme to use. 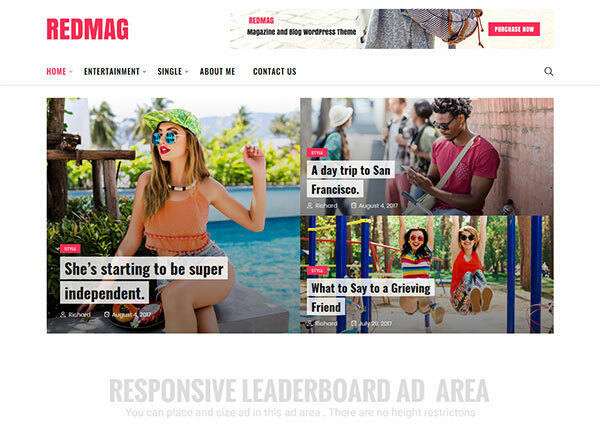 It allows you to design an advertisement-optimized magazine style site on niches like health, sports, fashion, literature, cars, beauty products, travel, etc. The admin panel is easy to use and comes with pre-enabled support for affiliate marketers as well as AdSense publishers. Start your dot com journey with this theme and touch newer heights in terms of traffic and ad revenue. Regardless of how amazing your content is, unless you present it to viewers in an attractive way, chances of it going viral are not that good. This is where a theme like Sensational can play a critical role in your success story. It helps you showcase the awesomeness of your site in the best possible manner. It has multiple color combinations so that you can play around with them and give your blog a delicate touch. On top of unique color combinations, Sensational comes with awe-inspiring sliders, fascinating sidebars and dedicated ad space to increase your ad revenue. Give it a shot and feel the difference. 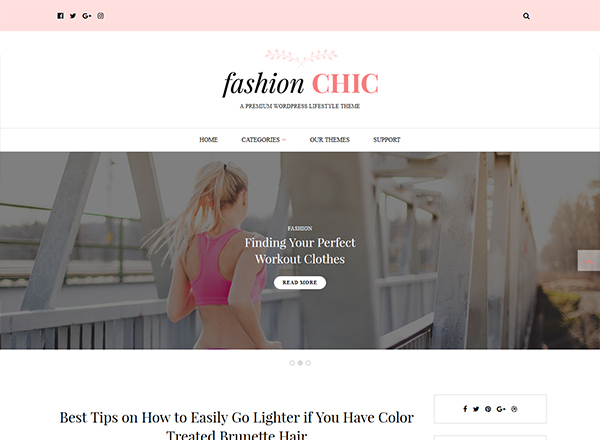 As the name suggests, Fashion Chic is a leading WordPress theme for sites revolving around fashion product reviews, latest fashion trends, and fashion news updates. If you’re running a blog in this niche, go ahead and install it for maximum benefits. Fashion Chic is lightweight and comes with a subtle style, attractive homepage, multiple category options and a broad range of Google fonts. 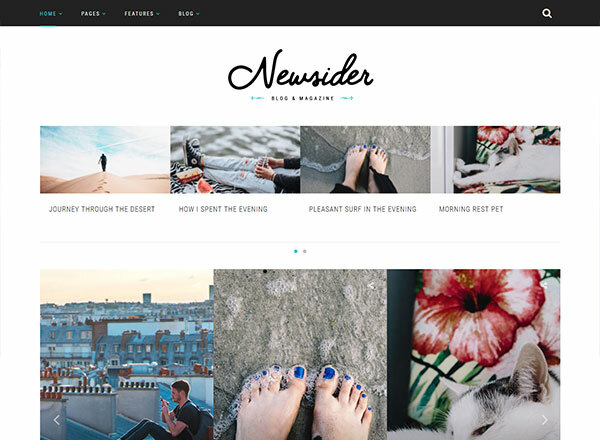 This is a must-have theme for all the site owners who wish to create user-friendly and beautiful magazine website. Its neat design, skilfully crafted layouts, eye-catching background and second to none homepage design, leave a lasting impression on everyone who visits your site. Besides, the social sharing options of Digezine ensure that your content is shared across multiple platforms. Have this theme installed on your site and turn it into a high-traffic web platform this year. Pinterest needs no introduction. From its design to features and traffic, everything about this social media site is so fantastic that nobody can sideline it ever. 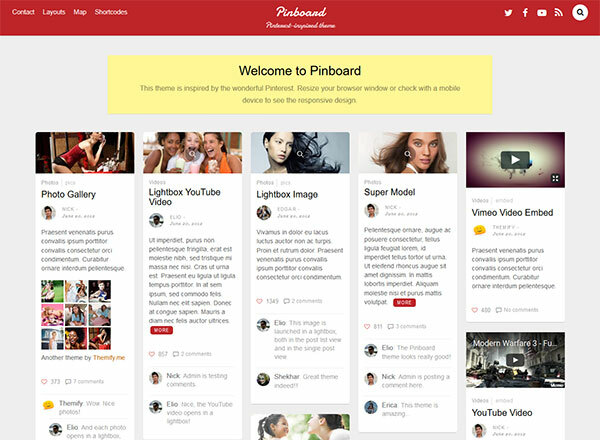 If you desire to design a site similar to Pinterest, then try Pinboard. It comes with infinite scroll and stacking layout options identical to Pinterest and offers your site fast speed, SEO responsiveness and a distinct look. Pinboard works quite well on smartphones as well as desktops, ensuring maximum traffic flow to your blog. 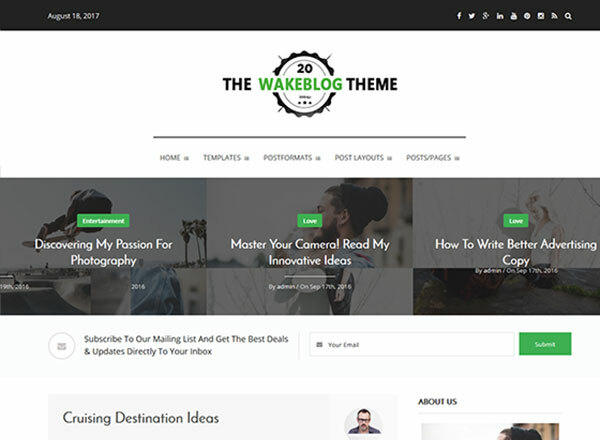 It is a modern-looking theme for bloggers and site owners whose primary focus is on ease of use, typography, minimalistic design and SEO-friendliness. 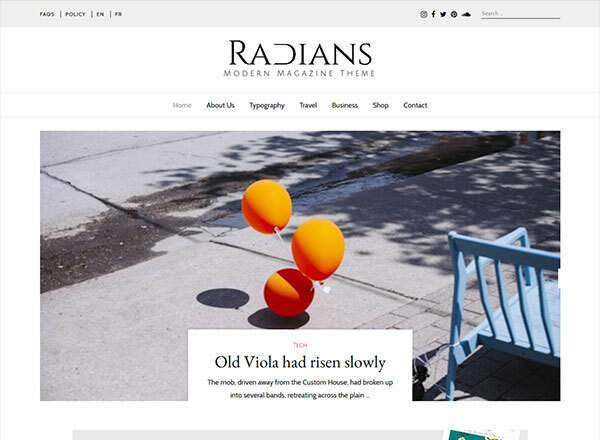 If you have a site covering subjects like tech, news, fashion, food, travel or anything similar, go ahead and check out Radians. This theme is packed with world-class features and can improve the overall performance of your site instantly. Food blogging is one of the fastest growing niches across the world. 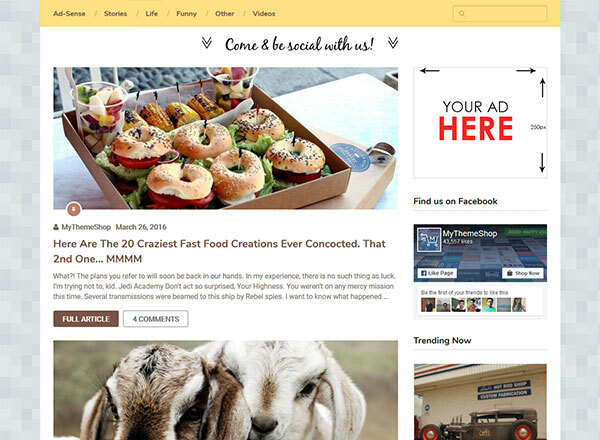 If you have a site publishing food recipes, reviews, and latest updates, then this theme will help you get desired outcomes. It is powered by an eye-catching homepage layout, flexible sidebars, multiple categories, unique color concepts and last but not the least, SEO-friendly design. 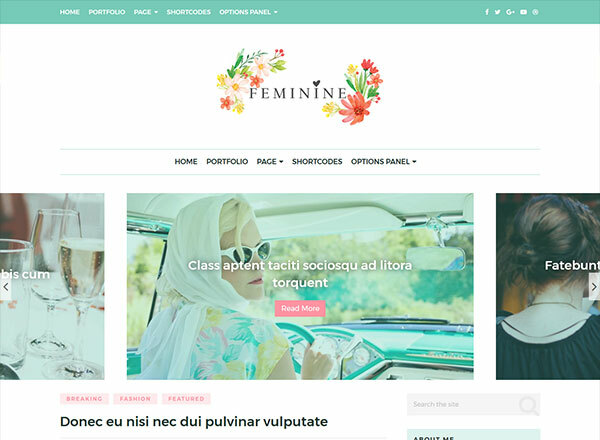 Feminine is designed primarily for the sites revolving around girly stories, concepts, product reviews and industry trends. From color combinations to homepage design and the three slider layout, all of its features are in perfect sync with its vision. To run a news site and to keep it profitable, you may have to think out of the box. Since the traffic is expected to be high on news sites, you cannot afford to have an ordinary theme installed. 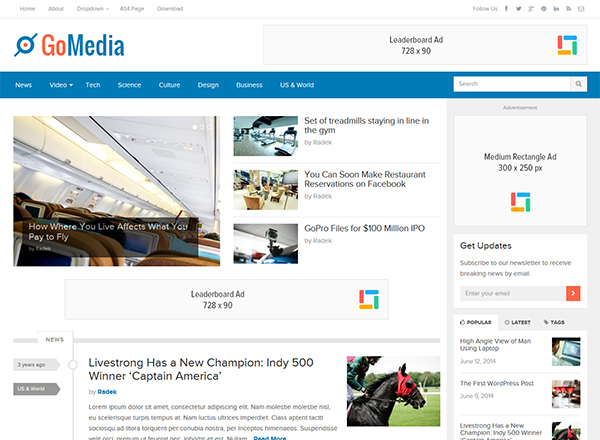 What you can do is install Newsider theme on your site. 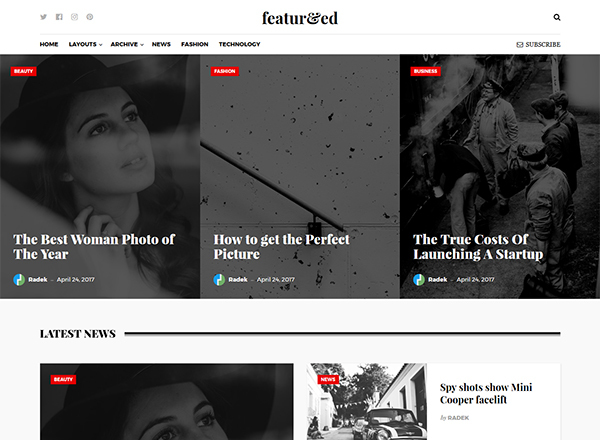 It is a magazine-style theme loaded with features such as customization options, multiple color concepts, eye-catching Google fonts, powerful admin panel, fast loading time and SEO friendly design. Newsider works terrific on smartphones as well as desktop sites. 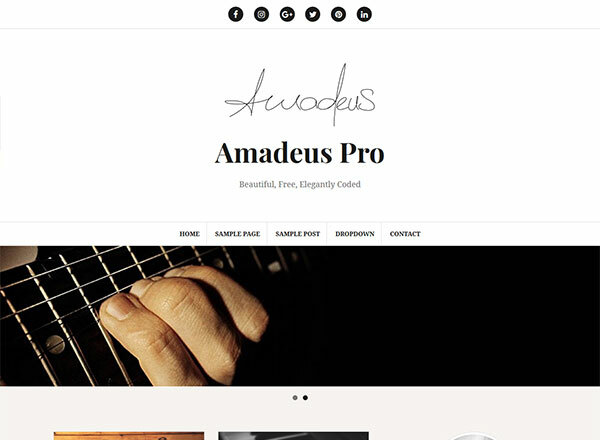 It is a clean, clutter-free and responsive WordPress theme powered by a modern, elegant and unique design. 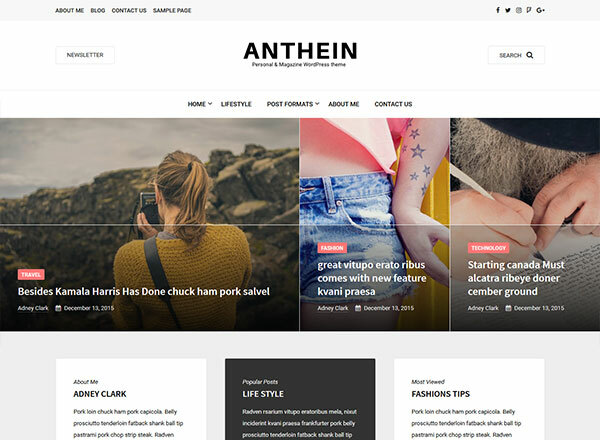 Anthein comes with full width as well as box width layouts, making it easier for you to create a personalized homepage. Additionally, it supports over eight post formats including Image, Standard, Audio, Gallery, Quote, Link, Aside and Video. Its powerful theme panel empowers you to make real-time changes in a flash and make your site stand out in a hassle-free way. If you are an author or a blogger wanting to design a site on which users can have a seamless reading experience, then go for the Paperbag theme. It is a minimalistic yet modern looking theme with multiple designing and color options. 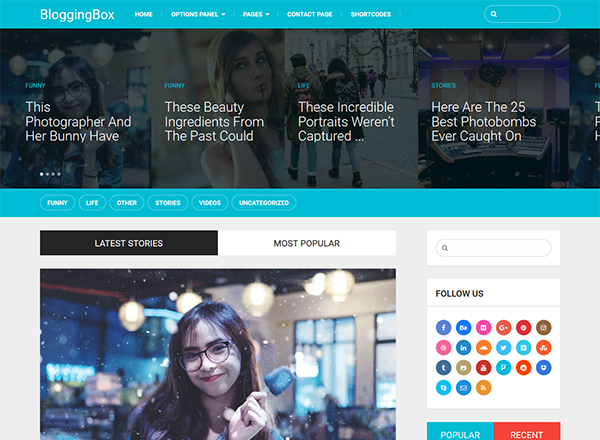 BloggingBox is a unique WordPress theme having a wide array of features like responsive design, shortcodes, tons of customization options, easy to use widgets and much more. With BloggingBox, you get more than one feature-rich layouts that can be activated with a single click. If you don’t want to waste your time doing a lot of customizations and want to keep things simple, GoMedia is a perfect theme for you. It is easy to install, comes with a unique homepage design, has dedicated space for third-party advertisements, and requires no knowledge of coding from your side. Keep it simple, keep it classy! 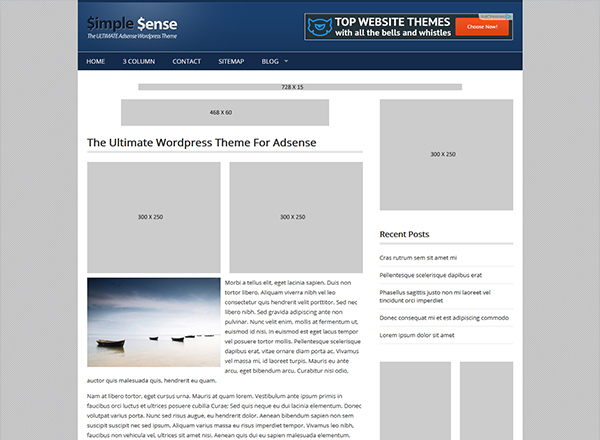 It is a simple theme having a broad range of features to give your blog a unique touch. Wake is powered by super fast speed, SEO-optimized responsive design, and mobile-friendly design. Since these are factors for higher search rankings, your site is likely to get a steady boost in SERPs once you install Wake. It is the best option for those who are looking to integrate attractive features in their website themes. 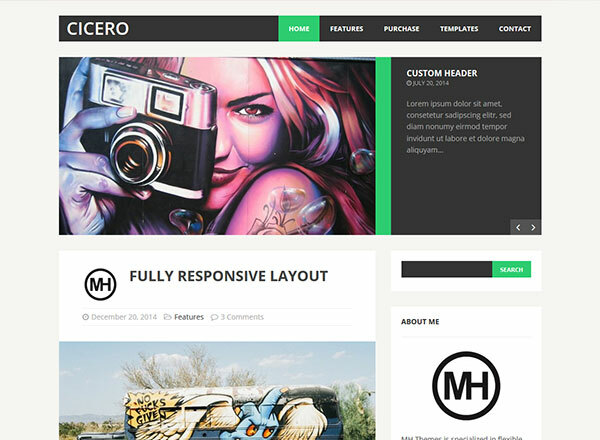 MH Cicero is minimalistic, lightweight, beautiful, and packed with a lot of useful widgets best suited for business, tech, entertainment, travel and other major niches. Have it installed on your blog and fine-tune the overall appearance easily. Your search for a classic and modern looking theme ends with Pinmaister. It comes with a beautiful drag & drop homepage, Ajax Pagination, Favorites option, infinite colors, custom widgets and an SEO ready design. 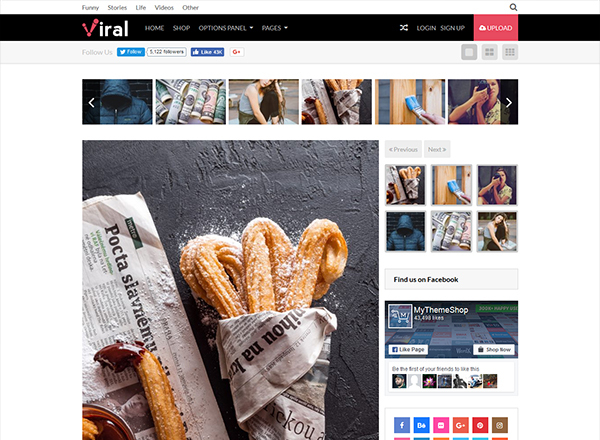 Viral is a stylish, beautiful and modern looking theme that loads fast and requires no technical knowledge for installing and customizing. Its amazing layouts, beautiful galleries, solid admin panel, crisp typography and clean code design make it a must-have theme for sites receiving massive traffic. Give it a try and see an immediate jump in your site’s traffic. Given the ever-rising popularity of multi-niche blogs these days, you might need a perfect theme that can do justice to the efforts you put in to make your site work. If that’s the case and you want to fine-tune your multi-niche site, then go ahead and try RedMag. It supports AdSense ad units and has multiple customization options for a higher CTR. Apart from this, RedMag comes with a distinct homepage design good enough to keep readers hooked. 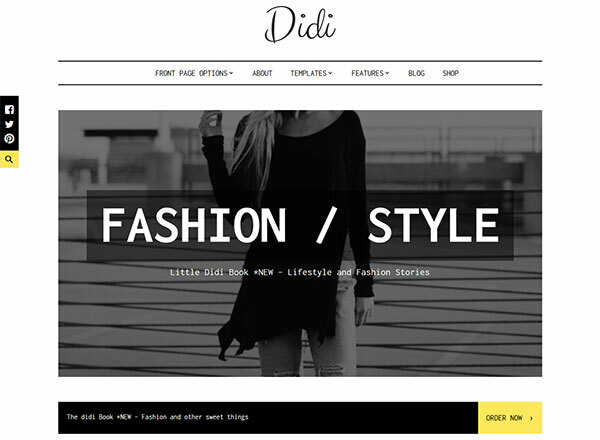 Didi is a stylish theme and can be installed on sites publishing news about fashion, lifestyle, latest entertainment updates or even personal portfolios. It is loaded with an incredible homepage layout and has a long list of world-class features to turn your site into a thriving online venture. Fashion is a huge market and requires a tremendous amount of efforts from your side. 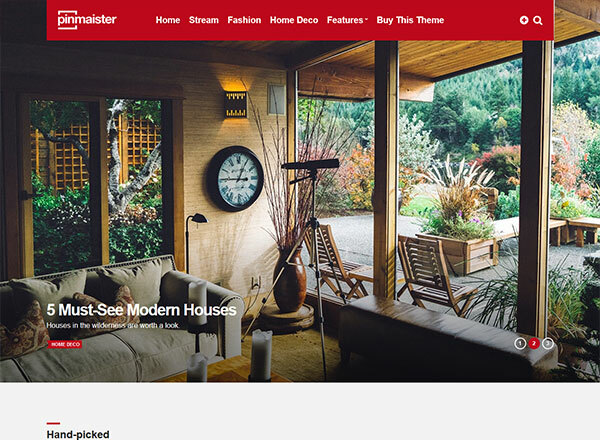 You cannot have an ordinary theme installed on your site if you aspire to conquer this niche. That’s where a personalized theme like Monte comes handy. It is unique, minimalistic, light-weight and exclusively designed for fashion bloggers. It is a minimalistic theme coupled with a magazine style homepage, fast loading speed, a broad range of Google fonts and eye-catching color combinations. Assuming you have or wish to have a site revolving around tech, fashion, travel, entertainment or healthcare, try Moment. With so many features waiting to be explored, Moment won’t disappoint. Within a short span of time, Ad-Sense has become the most preferred theme among publishers who rely heavily on AdSense income. With lightweight & SEO friendly design and tons of extra features to increase ad CTR as well as revenue, it has no competition in the market. Regardless of which niche you’re exploring, if you have Google AdSense enabled on your site, opt for Ad-Sense theme. 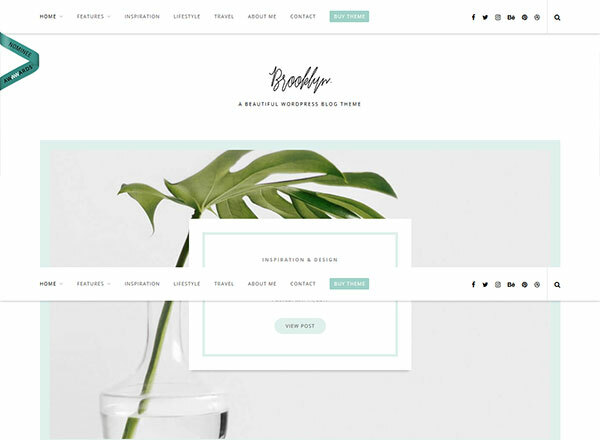 Brooklyn is a simple yet elegant theme, equipped with necessary features to showcase published content stylishly and efficiently. Some of its highlighted features include a bunch of post & layout options, featured slider area, full-width Instagram footer area, and much more. It is a modern and stylish theme having world-class features such as validated code, browser compatibility, unlimited choice of colors, custom theme widgets, localization, theme options panel, and what not. With this theme installed on your site, you cannot only reduce the site load time but also get rid of all the possible SEO-related errors. 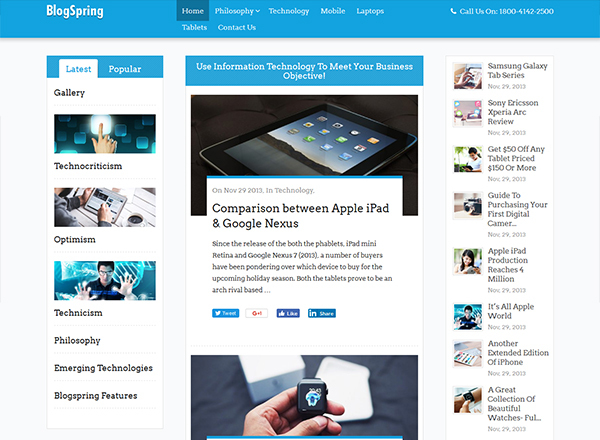 If you run a publication, breaking-news site, tech blog or any other web portal around latest happenings from around the globe and want to give it a professional touch, then Featured theme is best for you. It is modern, stylish, has an uncommon homepage layout and is fully responsive to different device screens. 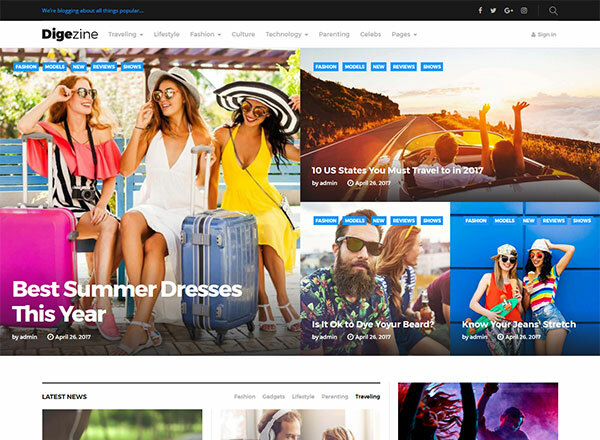 Duel sidebars, multiple category options, excellent post layout, and a responsive homepage are some of the features that make BlogSpring an unrivaled and first-rated WordPress theme. It is packed with some fantastic color combinations, lightweight design, and unequaled typography. 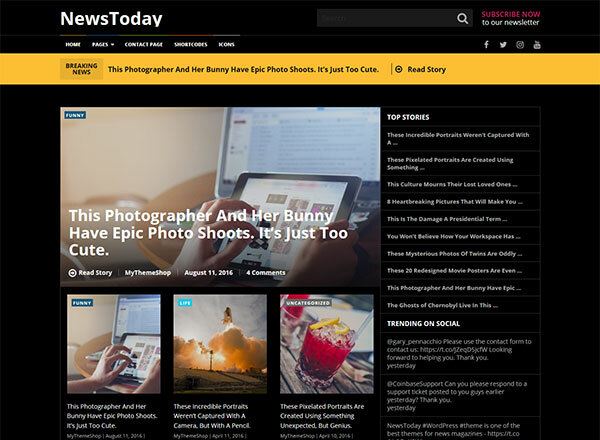 As the name suggests, NewsToday is a leading theme commonly used on news sites revolving around tech, finance, breaking news, gaming, sports, politics, newspapers, travel, etc. It is fully responsive to different screens, loads very fast and delivers top-notch user experience. 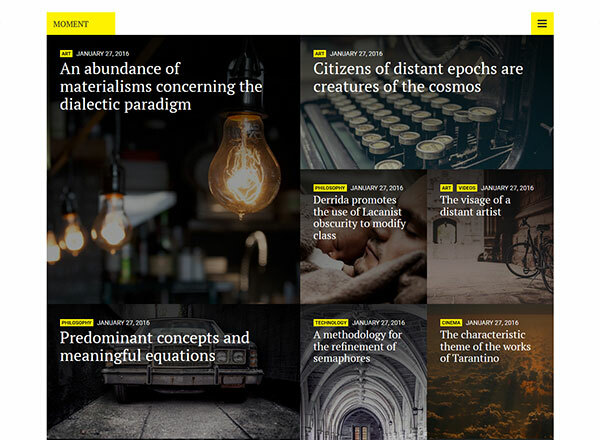 Furthermore, its beautiful homepage layout, unique color combination, flexible sidebar and targeted Ad space make NewsToday a must-have theme for all those webmasters who seek high user engagement and ad revenue on their sites. A unique WordPress theme fully dedicated to fashion bloggers looking forward to creating a unique, fast-paced and stylish website in a hassle-free manner. 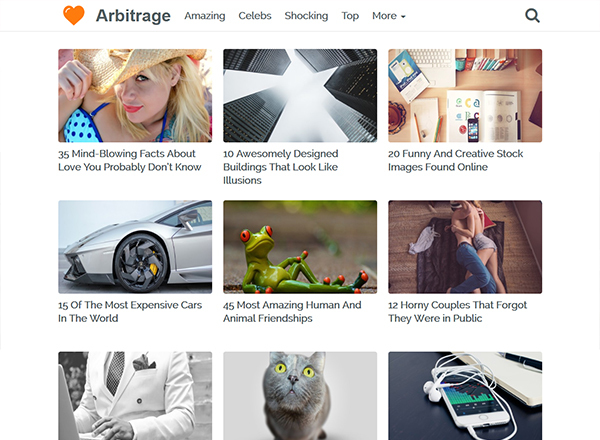 Apart from fantastic colors, a broad range of fonts and beautiful homepage design, the one thing that makes Arbitrage stand out in the market is its native ad experience. Have it installed on your site and increase your CTR as well as earnings by a significant margin. Arbitrage is easy to install and has a powerful admin panel to make real-time changes on your site. Another minimalistic and simply designed theme for those professionals who are eagerly looking forward to increasing their AdSense earnings. It comes with pre-enabled support for multiple ads on each page and puts them in crucial spots so that the click-through rate remains high. If you wish to design a clutter-free site without giving up on ad earnings, Simple Sense is a perfect theme to move ahead with. 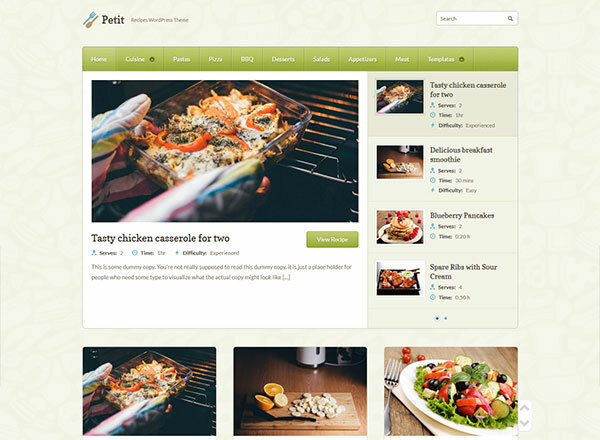 It is an attractively designed, pixel-perfect and fully-responsive theme equipped with hand-written CSS3 and HTML. Despite having a feature-rich homepage design and multiple widgets to improve user engagement, NewsTimes loads pretty fast and scores well regarding SEO-friendliness. If you write product or service reviews on your site, you cannot find a better theme than this due to pre-enabled schema markup. Running a health blog in today is not an easy task. You need to have a sound understanding of the products, services or solutions you cover on your site. Besides, this presentation should be made efficiently. That’s where a theme like JustFit comes handy. 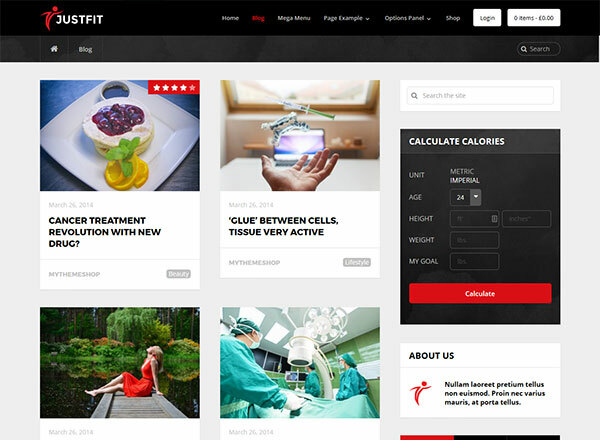 Whether you’re a fitness community owner, online magazine moderator, personal trainer or run a local gym, JustFit has a broad range of unique features good enough to help you expand your business. This post was written by Sunalini Rana. She is a working mom who left her stable career as a human resources manager to pursue her dream of becoming a professional blogger. She’s self-taught in web design and photography, and always loves learning new things and helping others along the way. She also has an unhealthy passion for delicious food like pizza and burgers.